Temperature Alert USB Standard Edition server temp. monitor. 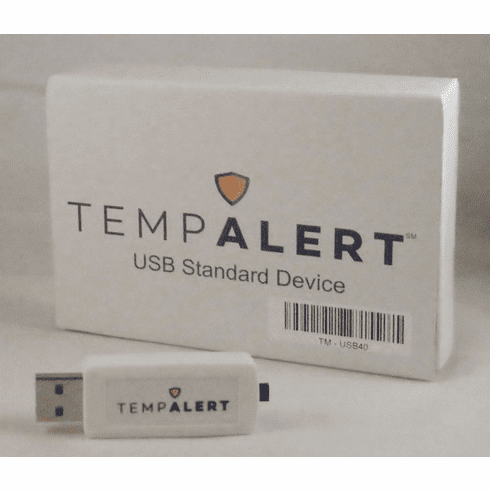 Chosen by IT professionals worldwide, the Temperature Alert USB Edition is a cost effective and efficient way to monitor the ambient temperature in server rooms, data centers, computer rooms, network cabinets as well as refrigeration storage. It protects valuable materials and IT equipment by alerting you of a problem via email when the temperature rises or falls outside of an acceptable range and the optional PC shutdown protects your equipment from overheating. The Temp@lert USB temperature monitor can be located away from the host PC using any standard USB extension cable (max.16’). Because this unit is powered via the USB port on a computer, it never requires new batteries or an AC power adaptor. The temperature sensor is accurate to within ± 1.0ºF (± 0.5ºC) and can report temperatures from -40°F to +200°F (-40°C to 93°C). Easy to use, the USB Edition provides customizable real time alerts to one or more email address if the temperature goes above or below the set temperature limits, as well as when it returns to normal. Users also have the option of receiving status emails showing current temperature readings and data graphs of temperature history; from 1 day to 3 years. Real time graphing and XML support provide you with the tools you need to easily integrate temperature readings into websites and other third party applications. The Temperature@lert USB connects to your PC via an available USB port and requires an always on Windows server or desktop with internet access to operate and send email alerts. The USB Edition runs on all the latest 32 and 64 bit versions of Windows including XP, Server 2003, Server 2008, Vista and 7. In addition to 10 MB of hard drive free space, a Pentium III or higher and 128 MB RAM is also required. There are no activation fees or monthly fees with the USB Edition. Temperature Alert USB Edition comes with a one year warranty on hardware should a failure occur during normal use. Customers also enjoy one year of free technical support. English Dimensions: H: 0.6", W: 1.0", L: 4.4"